How do I add details of a pet I have found? Adding details of a pet you have found is free and easy. Simply click on the Found a Pet? link and enter your details along with the details of the pet. We will send you a confirmation e-mail to validate your e-mail address and as soon as you click on the link in the e-mail, you will be helping someone to find their missing pet. The whole process should take no longer than 5 minutes. How do I find my missing pet on the Pets Located website? 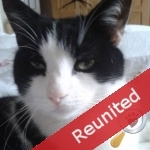 To start with you can search our database of pets which have been found. If you find a pet which you think is your missing pet you can register your details and you will then be able to send a message to the finder via our secure messaging service. If you want to narrow the search area down or you can't see your missing pet on our website, simply register with us and you can a) specify a smaller radius in which to search and b) benefit from the peace of mind of knowing that for a whole year we will e-mail you with any pets which are added to our database which match the details of the missing pet which you have entered. More details of how we work can be found here. This service is only available for people who have registered their lost pet on this website. Registration starts from only £5.00 per pet which includes fully automated searching on your behalf. Other registration periods are available. PetsLocated.com is an automated, web only service and we are sorry but we are unable to contact people on your behalf. How do I make contact if I believe my missing pet is on this website? If you see a pet on this website which you think is your missing pet you can register your pet's details and you will then be able to send a message to the finder via our secure messaging service. If this turns out not to be your pet, you will benefit from the peace of mind of knowing that for a whole year we will email you with pets which are added to our database which match the details of the missing pet which you have entered. Finders and Owners need to register on this website and they can then communicate through the site's Secure Messaging Service. It is the responsibility of 'finders' to directly decide if someone claiming a found pet is the genuine owner. The Secure Messaging Service enables Finders and Owners to communicate anonymously with each other and also to keep the location of the pet anonymous until such time as both parties are happy to release further details to each other. 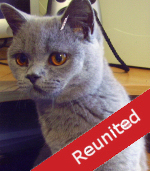 Registration of a Lost Pet starts from £5.00 per pet and includes fully automated searching. Other registration periods are available. Registration of Found Pets is Free of Charge. How does Pets Located work? As well as providing you with the ability to search the Pets Located website yourself, by using the latest matching technology, we continually check the details that you have entered about your pet (such as colour, size, age, location last seen etc) against new entries that are added to the database and e-mail you with any potential matches. You can then send messages via our secure messaging system to the finder of a matching pet to obtain more details and ascertain whether it is indeed your missing pet. At Pets Located we have developed a unique matching engine which checks lost pet details against those registered as 'found' on the database. Based on a number of criteria, a score is calculated which shows how similar two pets are. Occasionally you may get 'matches' which are fairly obviously incorrect to a human, but because of the similarities in a number of other areas, the match is put forward to you - we don't want to exclude a potential match because the finder didn't know the exact details, or entered them slightly differently to the owner. For example, is a Dalmation dog: white with black areas, black with white areas, or a black and white dog?? You may also find matches which are a large distance away from where the pet was lost. This is taken into account when the score is derived. We regularly have cats which get trapped in lorries and have travelled long distances, or dogs which have been stolen and moved to another area of the country, so again, we don't want to exclude these as potential matches. How does the Secure Messaging Service work? When a message is sent via the website, Pets Located will email the recipient advising them that there is a message on the website for them. Messages are then available within the My Messages section when Finders/Owners are logged in. Messages can be replied to from there as well. If you decide to give your personal details to the other party in a message, please ensure that you are comfortable with doing so and that the other party is genuine. How much does a listing on Pets Located cost? Found Animal postings are Free of Charge. We offer 12 month (£12.00), 6 month (£9.00), 3 month (£7.00) and 1 month (£5.00) subscriptions per pet for lost pets. Why do we charge for Lost Pet listings? We make a nominal charge so that we can continue to improve the site and its automatic matching functionality. 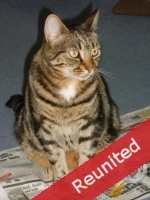 PetsLocated.com automatically matches lost pets against found pets every time a new pet is added (whether lost or found) which we believe is a unique service and ensures that matches happen very quickly rather than people having to trawl through huge listings (there are currently 8,881 Found pets listed on the site). Whenever matches are made the owner is automatically notified by email - 24 hours a day, 7 days a week, immediately. The secure messaging service enables Finders to be sure that they won't get people trying to claim animals which aren't theirs because they can make sure the person is genuine and that the pet exactly matches the one they've registered before they give any details of where the pet is. Can I register without adding a lost or found pet? You can register as Animal Welfare Organisation or Vet (i.e. someone dealing with 'Found' pets) without adding a pet. Owners who have lost a pet should register their pet's details at the time of registration. This website automatically does the matching process for owners of missing pets, thus saving the time and effort of manually searching the site as the number of lost and found pets increases daily. This website continually, automatically matches the lost and found listings against each other and alerts owners by email whenever a potential match is made thus negating the need to do manual searches. Please note that accounts which have been set up but not had pets added will automatically be deleted after a set period of time. Why do I need to validate my e-mail address? To ensure that only genuine entries are added to our database, we do not show the details of any pets which have been found until you have validated your e-mail address by clicking on a link which we provide in an e-mail that we send to you. You only need to validate your e-mail address once. You can then add as many found pets as you need to without further validation. If you do not receive the e-mail you can request a copy. How do I validate my e-mail address? When you register the details of a pet which you have found, we will send you an e-mail containing a link which you must click on (or copy into your browser). This then confirms that the e-mail address is valid. Can I register more than one 'Found' pet? Yes. Once you have created and validated your account by adding the details of your first found pet, when you log in you will be given the option to add the details of other found pets. Or you can simply click on the Found a Pet? link and follow the instructions for logging in from there. How quickly will my listing appear on the website? If you are registering a lost pet, your details will become active as soon as you have paid the registration fee. If you are registering details of a pet you have found, your listing will appear as soon as you have entered the details on to the website and validated your e-mail address. How do I pay for my Pets Located 'Lost Pet' listing? For people registering a lost pet, we accept the following debit and credit cards: Visa, Mastercard, Switch/Maestro, Visa Delta and Visa Electron. Unfortunately we have no facility to accept orders when payment is by cheque or cash. There is no charge for registering details of a found pet. We use WorldPay to process our credit/debit card payments. WorldPay is a well established company specialising in electronic payment processing and for added security you are directed to their secure server to enter your card details. Your card details and are not seen or stored by ourselves. What happens when you make a match of my pet's details? 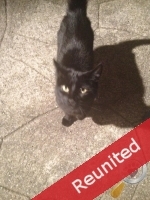 When our unique matching engine finds a pet which potentially matches your missing pet, you will be sent an e-mail with the details along with a link to view the information on this website. You can then contact the finder through our secure messaging system. Matches are rated on a scale of 1 to 5 (1 being an unlikely match, 5 being there are lots of similarities). 'Potential Match' notifications are only sent out where the website rates the match as 3/5 or higher, but owners can always check for lower rated matches by visiting the My Matches page and selecting one of the 'green paws'. How do I remove my Lost Pet from the website? If your pet has returned home itself, has been reunited with you, or has been found deceased, please deactivate your listing on Pets Located to ensure that the database is up to date for those who have yet to be reunited with their pets. You can do this by logging in and going to the My Account page and selecting the 'Remove from site' option to the right. If you wish to completely remove your account from this website, you can do so by going to the My Account page and selecting the option at the bottom of the page. How do I deactivate a Found Pet posting? This can be done through the My Account page when you are logged in to this website. Under the 'Options' column there is link to 'Remove from site'. Your listing will be removed from the main website but you will still be able to access and reactivate it for 5 days should you need to. After this time the listing will automatically be archived. How do I edit or change my details when I have registered? When you log in to your account there is the option to 'Change your details/password'. Also, on your My Account page, under the list of pets there is a section 'My Login Details'. You will be able to change your e-mail address, password and other personal details from within that section. I have found a pet that is injured (or deceased), what should I do? If the pet is injured and still alive please call your local vet who will be able to advise what to do next. If the pet is deceased you should contact your local Council Environmental Department who will be able to advise what to do next. You may also wish to add details of the pet to our site as the owner may be looking for the pet and may wish to know the outcome. Adding details of a pet you have found is free and easy. Simply click here and enter your details along with the details of the pet. We will send you a confirmation e-mail to validate your e-mail address and as soon as you click on the link in the e-mail, you will be helping someone to find their missing pet. The whole process should take no longer than 5 minutes. How do I add or remove or change a photo? Simply log in and go to the My Account page. There is an option on the right of each pet's details to 'Manage Photos'. Click on this button and it will take you to a page where you can easily upload photos. You can rotate photos on the preview page once they have been uploaded if you need to. Pets Located is an internet-only company and to keep overheads (and therefore the cost of pet registration) to a minimum we don't have a central phone number. We are happy to give as much support as people need and if you have a query which isn't answered on this page, you can use the Contact Us page and one of our support team will get back to you as soon as possible. By providing support by email we can often answer queries quickly and efficiently out of hours as well - which we couldn't do by phone. Do you pass my details on to any other companies? No. We have a policy of not passing details on to any other company. Our company is registered with the Information Commissioner as required by the Data Protection Act - registration number Z3159369. We will only send e-mails to the e-mail address supplied by you when placing orders and will remove you from the mailing list as soon as you request us to. I have found a dog - what do I need to do? If you have found a stray dog please register it on this site so it can be reunited with its owner as quickly as possible. Please also, where possible, get the dog scanned for a microchip. You must then contact your Local Authority who are legally responsible for stray dogs. A dog is classed as being stray if it is in a public place without its owner or the person who is responsible for it. A dog that is roaming or straying that is acting aggressively needs to be reported to the local police and dog warden. You are using a screen size of x . What if I have a query not answered above? Please send a message to us and we will respond to your query promptly.